The Internet allows you to communicate at long distance with your friends, family and anyone that is also connected to the Internet from their computer. 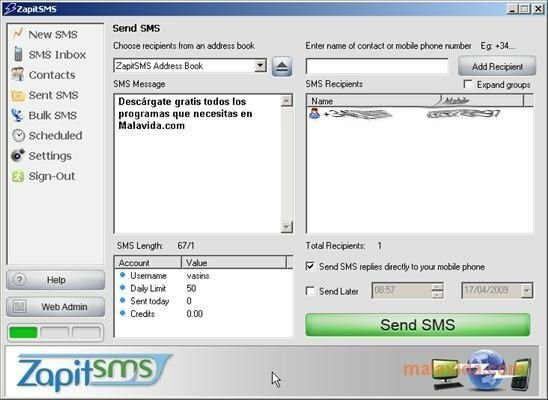 But thanks to ZapitSMS, you will be able to communicate from your PC with anyone by sending an SMS to their mobile at a low cost. This application offers you the possibility to establish communication between your PC and any mobile device at low cost. To be more specific, it provides a friendly interface from which the user can send text messages (SMS) at very competitive prices. - Easy to send text messages to mobiles from your PC. - Instant replies with notification of sent messages. - Perfect integration with your Outlook contact list. - Includes templates to create messages. 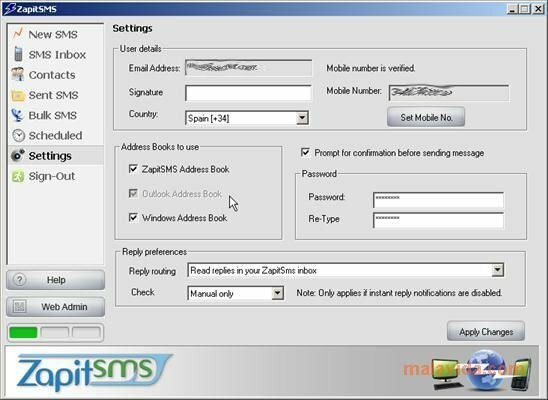 In order to try out the ZapitSMS message service, after creating a user account you will have credit to send 25 free SMS according to the conditions and policy established on the official website. When the program starts, it asks you to create a user account.